Arrangement from the Living Flowers exhibition. Week five: July 11 - July 17, 2008. Sogetsu Los Angeles Branch. Artist: Gyokusei Kumamoto. Photographer: Susan Kellogg. 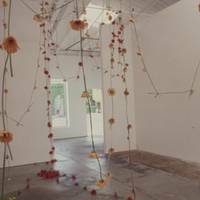 Anya Gallaccio, Installation view of In a Moment, 1997. 365 gerbera daisies. Courtesy of Blum and Poe, Los Angeles. Installation shots by photographer Joshua White documenting the exhibition Living Flowers: Ikebana and Contemporary Art. Photo documentation of ikebana arrangements from the seventh week (July 25–31) of the Living Flowers exhibition. Photo documentation of ikebana arrangements from the sixth week (July 18–24) of the Living Flowers exhibition. Ikebana demonstration by the Sogetsu Los Angeles Branch at the Japanese American National Museum on July 20, 2008. Photo documentation of ikebana arrangements from the fifth week (July 11–17) of the Living Flowers exhibition. 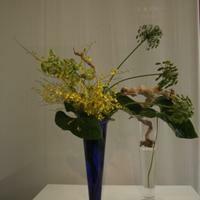 Photo documentation of ikebana arrangements from the fourth week (July 5–10) of the Living Flowers exhibition. Photo documentation of ikebana arrangements from the third week (June 27–July 3) of the Living Flowers exhibition. Photo documentation of ikebana arrangements from the second week (June 20–26) of the Living Flowers exhibition. Ikebana demonstration by the Ikenobo Ikebana Society of Los Angeles at the Japanese American National Museum on June 22, 2008. Photo documentation of ikebana arrangements from the first week (June 13–19) of the Living Flowers exhibition. Opening reception for Living Flowers: Ikebana and Contemporary Art on June 14, 2008 at the Japanese American National Museum. A photographic documentation of the installation of Anna Sew Hoy’s Why for Living Flowers: Ikebana and Contemporary Art at the Japanese American National Museum. Get a sneak peak (or advanced preview) of what to expect when the exhibition opens.